Designing an Eisenhower Memorial on the Mall in D.C. Sadly, the pending scheme by Frank Gehry for the Dwight D. Eisenhower Memorial proposed on a colossal four-acre site in the District of Columbia's civic epicenter is theme-park architecture. This term was coined by the late Times architecture critic Herbert Muschamp in describing work tied to jingo and nostalgia. The themes of "humble origins" and the interstate highway system as the determinate metaphors for a life's journey, especially when the subject in question helped sustain liberty as much as anyone in recorded history, perfectly fits Muschamp's bona fides for this critical category. Now is the time to take stock accordingly as the National Capital Planning Commission sits down early next month to make its final decision. They do so in the context of passionate disagreement, along with the Eisenhower family itself as is now broadly known. Gehry's plan is more attuned to the World's Fairs of the mid-20th century, such as Montreal's Expo 67. Philip Johnson's 1964 New York State Pavilion in Flushing Meadows Corona Park, Queens, still standing despite a three score debate over its adaptive reuse, also comes to mind. The proposed plan is a huge open-air pavilion, which despite its size, misleadingly and inexplicably edits an epic biography of preeminence in the ongoing American experiment that is second to none. It falls short both symbolically and pedagogically. Likewise it is a design conceived for a single once-in-a-lifetime encounter, one that ideally would be made from a fixed point of approach to make full narrative sense (i.e. "the line starts here") and before the trees grow to obscure such a fixed and demanding scenario. Maybe that's fine but where's the door? It favors novelty as opposed to "of its time" design done well; design which outlasts its time, complying with the implicit aim of the original congressional mandate. Paradoxically, despite its enormity (a scale transcending even that of the Amun-Re Precinct of Luxor's Karnak Temple Complex), there is no way to incorporate this amorphous zone into the daily rhythms of shared urban existence. And, yet, it also does not limit it in any way as a destination terminus (e.g. the de facto cemetery and cenotaph of the new National September 11 Memorial). It is a place to pass through. A parallax ensues. 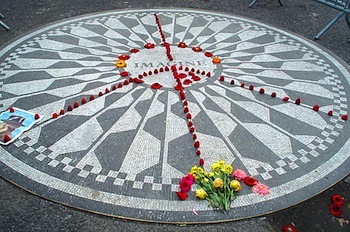 In contrast, John Lennon's Strawberry Fields in Central Park shows how a well-designed memorial with its conceptual eye on daily benevolence can accomplish exactly that. Worse still, this monumental scale turns its back on the contiguous Lyndon B. Johnson Department of Education Building and those women and men who work there, day in and day out, to fulfill their statutory duties. Was not that hubristic urban planning mistake learned 50 years ago at New York's Lincoln Center, where except for one library door, a rear facade of loading docks and high terrace walls served only to remind residents that their attendance was not expected? It seems a regrettable reminder, too, of the benighted World Trade Center's former plaza, where no one wanted to go unless they had to. Should maintenance and enduring access be factors for the architect? You bet. To assert otherwise is unforgivably shortsighted. No doubt Gehry believes honorably that he has considered them but his view flies in the face of the realities of maintenance during these protracted times of limited public resources and constantly advancing options for co-existing virtual interface. It seems unwise to delimit such inevitable progress in the dynamic realm of technological interpretation. Eisenhower with his wise post-war burst of enlightened public investment in infrastructure --required but not attainable by the private sector alone -- completed it 20 years after its original Depression-era conception. That is why there are already tens of thousands of Eisenhower Interstate System signs along the shoulders of the entire roadway network -- a tribute well-tended since the mandate to do so by President George H.W. Bush in 1990. Instead, this particular memorial belongs where it is, and, regardless of any unfair slight to those who defined progress differently 60 years ago, we now know better than to defer to the car at the expense of the pedestrian. There is no turning back due for starters to the kind of traffic Marinetti apparently never anticipated. Alas, speed and theater are not among the D.C. driver's daily experiences. They belong to a century-old fantasy of Tomorrowland. Nor is this plan suited to the long-term design and civic obligations of memorial design at its best. While Frank Gehry has been one of the foremost visionary designers on the globe, above all in the late-20th century, especially when inventing freestanding sculptural forms reliant on a pre-existing context for aggressive contrast or neutral yield, in this case he has fallen short of past rigor. This plan fails to fulfill the full spirit of the commissioning blueprint and the statue that spawned it in the first place. Such shortcomings have nothing to do per se with style or preferred precise design vocabulary. Yet, indeed, the classical tradition at its best transcends time with the nearby Lincoln Memorials and the astonishing Washington Monument serving as ageless examples. Many feel the same about the abstract modern simplicity of Maya Lin's renowned Vietnam Veterans Memorial, which succeeds at honoring the dead even for those without any living connection since its topographical sanctity spawns investigation and reflection. Whether or not it is the case with Mr. Gehry, the men and women charting this vital memorial course need to go back to the drawing board aka AutoCAD and make sure the full potential at hand takes permanent hold in the hearts and imaginations of future visitors including those encountering this hallowed site without prior expectations, and, perhaps most challenging, those passing by every day.